Synopsis: What does the gospel say about your fears? What does it say about the irrational ones, like sinkholes in the Target parking lot? How does it speak to the rational ones, like pet scan predictions? And does the gospel have a word for the fears you feel you’ll have for life, like the possibility of losing the one you love most? This book talks about miscarriages and eating disorders. 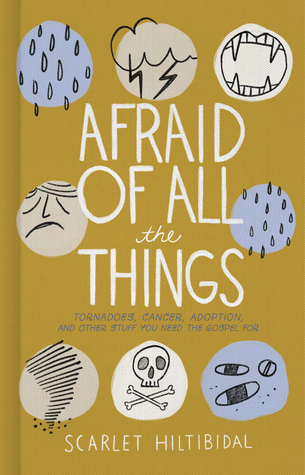 Afraid of All the Things is about Scarlet’s life full fear and anxiety, and how the gospel helps overcome even the worst fears. This book is broken up into three parts. Part one is titled “My Fears Do Not Define Me”. In this part, Scarlet talks about things like her hypochondriac collapse in a grocery store and her fear of flying. In the second part, “My Fears Will Not Defeat Me”, Scarlet tells the story of the time she slept through hurricane Andrew, when her mother was diagnosed with cancer, and her health. The third part is titled “My Fears Aren’t Forever” and is about her Matron of Honor Toast, and adopting her deaf daughter from China. Throughout all her stories (some funny, some heartbreaking… all totally relatable), Scarlet constantly points back to the gospel and how Jesus defeated everything at the cross. She reminds the reader that God is more powerful than the evils we see here on earth, and that we need to meditate on God’s Word day and night because His Word is living and active. As someone who suffered from an eating disorder, I think this can be very dangerous for sensitive readers struggling with an ED. Other than that, I really enjoyed the book, and recommend it. I’m glad to have a new author on my radar.